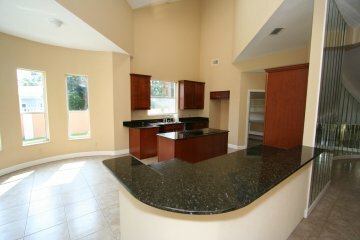 RENOVATED INTERIOR! BAY HILL COUNTRY CLUB COMMUNITY - WITH LAKE ACCESS! AMAZING OPPORTUNITY! 7625 SQ. FT.(heated & cooled) ACCEPTING OFFERS! 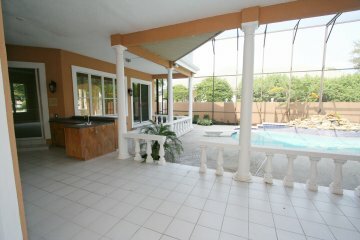 This spacious home boasts oversized rooms for formal entertaining as well as for family living areas. 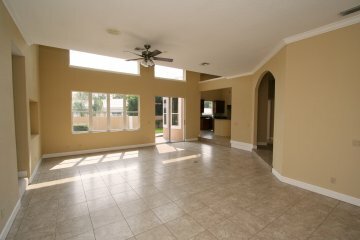 It is not very often that we can offer a home with this much space at this price. The residence is nestled on a quiet cul-de-sac in Bay Hill – a prestigious golf course community founded by the legendary Arnold Palmer! 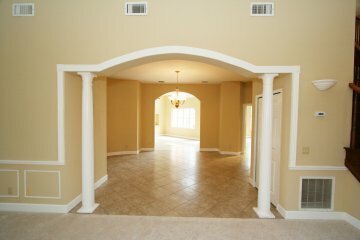 The residence has an impressive Porto-cochere with a fountain entry. 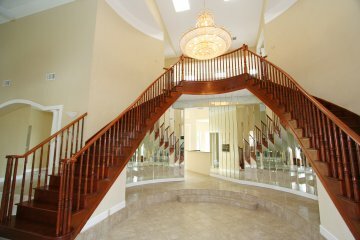 Upon entering you are greeted by a dramatic twin staircase in a wide two-story formal foyer. 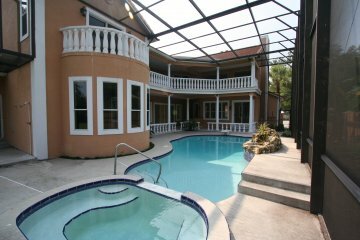 This is a grand home for large gatherings and a fun place to visit only 15 minutes to Disney and all Orlando attractions - yet it is tucked away in a quite location! 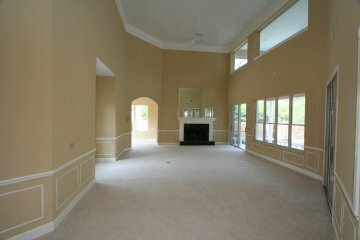 A 38’ living room and a 21’ dining room are perfect for formal entertaining. 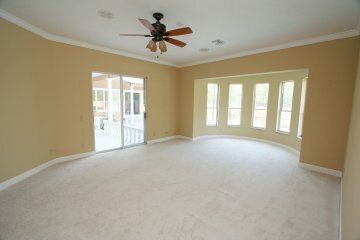 The family living areas are also very large and feature a 28’ family room and a 22’ kitchen. This home will easily accommodate more than one family and/or many guests. For this reason it could be considered a wonderful corporate or family retreat! The first floor offers you a large master bedroom suite and luxurious bath, two other large bedrooms, one of which can be used as a study or den. 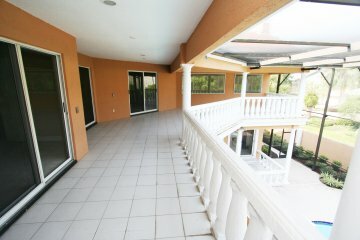 The staircases ascend to a 45’ balcony on the second floor from which the other four (4) secondary bedrooms are located. The interior colors are neutral. The home was built in 1988 but has been refurbished. 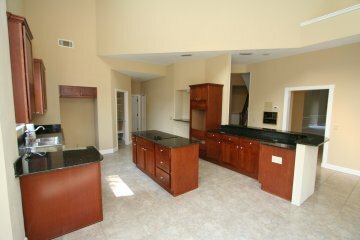 Solid Cherry wood cabinets in the 22’ kitchen are topped with attractive black granite. 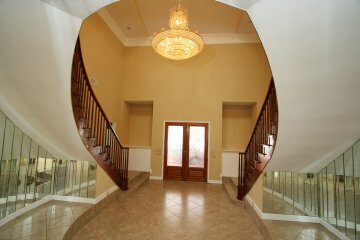 There is a private staircase that leads to a 45’ bonus room (fully air-conditioned, carpeted and finished out) which could be converted to a very large theater, or use it just as it is for a children’s playroom, or adult game room. 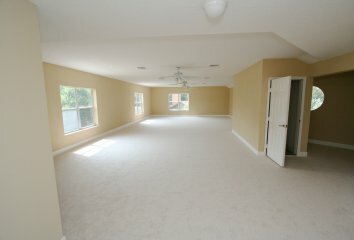 Use your imagination and you will think of many uses for this space. We call this “flex” space – Use it as you need it! 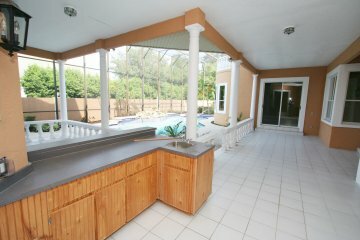 The outdoor entertainment area is fully screened and consists of a serving/snack counter with wet bar, a large swimming pool and water trickling down a stone waterfall into the heated spa. Be sure to bring your boat! The owners of this home have access to the famed Butler Chain of Lakes through a private boat ramp reserved for residents of the community.